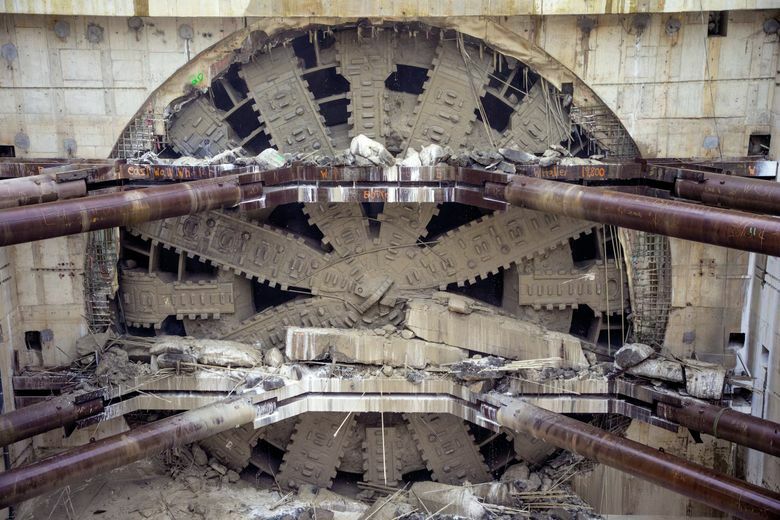 The world’s largest tunnel drill spent Tuesday morning kicking up dust and grinding into daylight. 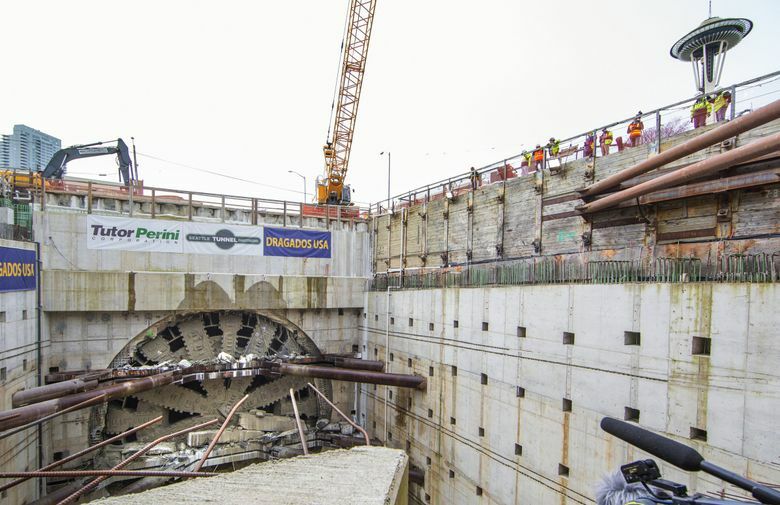 Workers and politicians celebrated, but a lot of work remains before motorists drive the double-deck, four-lane tunnel, says a project administrator. 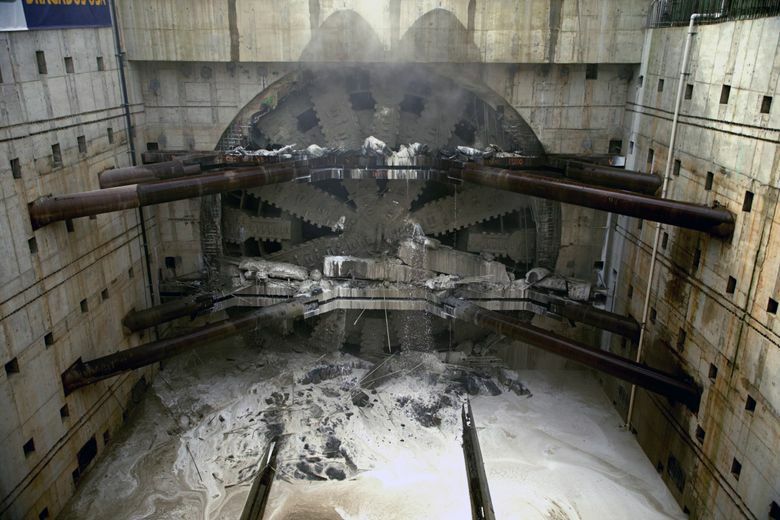 The world’s largest tunnel drill has halted for cleanup work, after it spent Tuesday morning kicking up dust and grinding into daylight. “We have breakthrough,” proclaimed Joe Hedges, the state’s Highway 99 administrator, at 11:26 a.m. The next steps include clearing concrete rubble off some steel braces inside the disassembly vault where Bertha is emerging — so the braces themselves can be safely removed. Some chunks are more than 15 feet long. To mark the historic day, the Seattle Great Wheel was lit in green Tuesday evening, the color of Bertha’s circular cutter head before drilling began July 30, 2013. The machine will take three weeks to push forward to the north end of the vault, followed by four or five months to dismantle the front end. “Almost all the parts are not reusable,” said Takashi Hayato, U.S. president of Hitachi Zosen, which built the giant machine in Japan. Hedges said the final push Tuesday morning ended exactly on target. In fact, the workers steered the nose almost two inches upward, he said. That way there’s enough clearance for Bertha to descend and slide onto steel cradles within the vault. 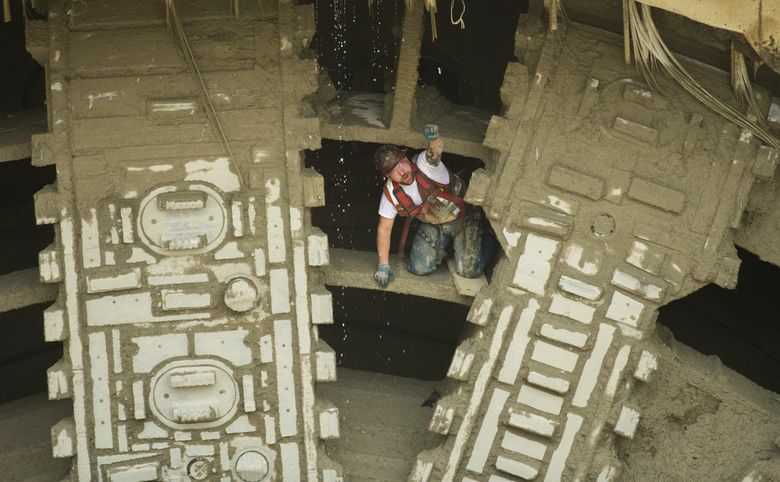 When the cutting wheel finally stopped, workers emerged in groups of three to roost between spokes and have their pictures taken, a tunneling tradition. Some unfurled a U.S. flag. That would have been impossible earlier in the dig from Sodo to South Lake Union, where any air in the front of the machine would exceed four times atmospheric pressure. 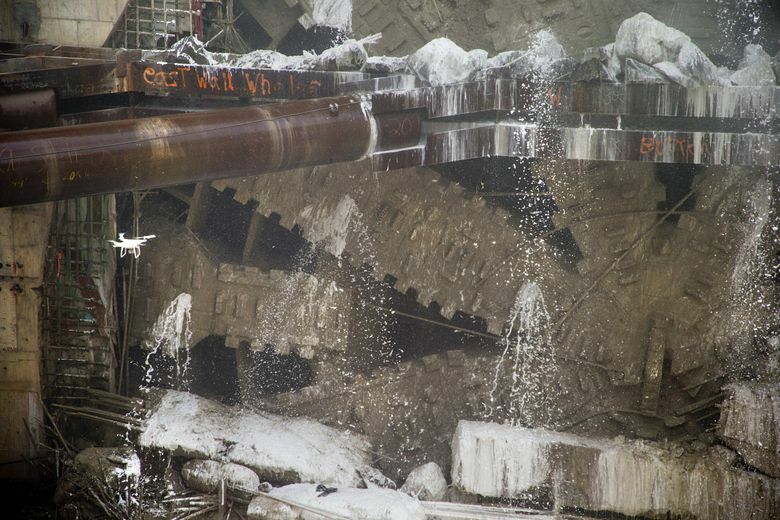 The bottom of the vault is a soup of concrete dust, water, and polymer lubricants that Bertha sprayed until the end. Still to come for the project are another 1 ½ years or so to finish highway decks, lights, ventilation and signals, followed by testing and work to attach tunnel ramps to connecting ramps around the north and south portals. 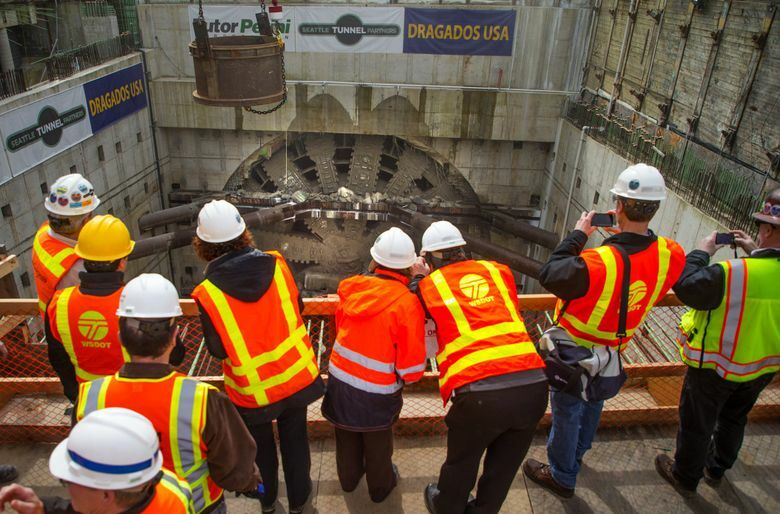 Bertha arrived 29 months late compared with its target date of October 2014. 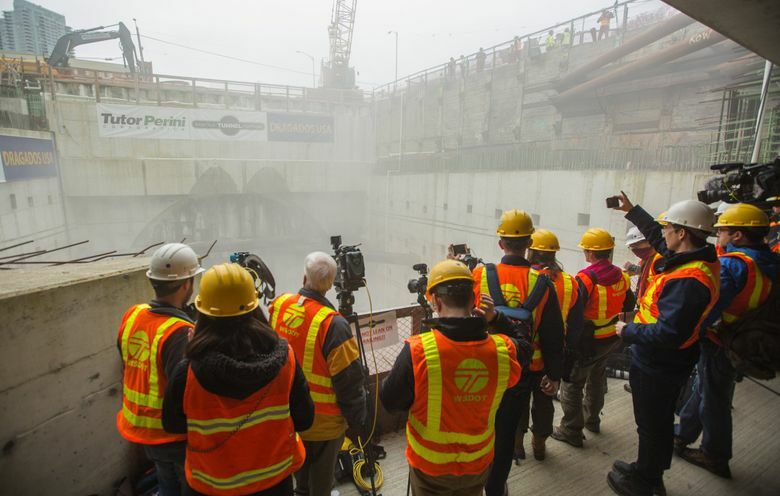 Seattle Tunnel Partners (STP) won the $1.44 billion construction contract, in large part, because its bid promised a drivable tunnel by the end of 2015, or a year earlier than the state required of bidders. Instead, traffic is expected to open by the start of 2019. Total cost of the Highway 99 project, including removal of the earthquake-damaged Alaskan Way Viaduct, a new waterfront boulevard and connecting ramps, is about $3.2 billion. Though the state and STP are fighting in court over a half-billion dollars in repair and delay costs, STP has also created goodwill by cruising at 40 or even 50 feet a day since passing beneath the viaduct last April 29. Hedges praised the contractors and the union workers who saw the nearly four-year dig through. But he noted that much work is left to be done before motorists use the double-deck, four-lane tunnel. “We’re not at the fourth quarter; we’re only at about halftime,” he said Monday. For Tuesday’s event, there was no public access to the north portal, just west of Aurora Avenue. Gov. Jay Inslee, Mayor Ed Murray and other dignitaries watched the breakthrough and held short news conferences afterward. 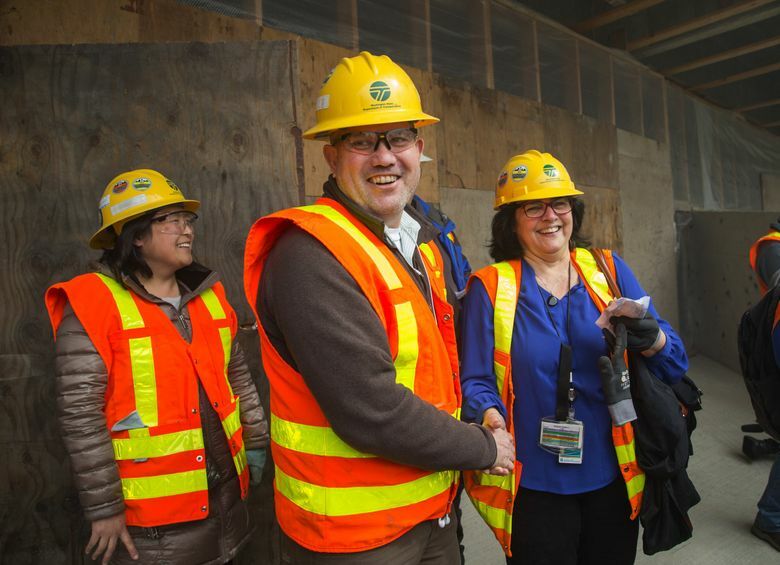 But Inslee said last week the technology is equally memorable, and he looked forward to watching the breakthrough. He recalled a visit early in the project, feeling like he was in a Star Wars film. Inslee also warned the state has far to go. “We’re still in a race against the next earthquake, to take the viaduct down,” he said. Murray said Tuesday it’s time to turn attention to planning a quieter, more scenic waterfront. Local property fees to fund parks aren’t secured yet. “This is a great day for Seattle. This is a transformative moment. I think this is the time when the city and the region will focus on taking down the viaduct, building a world-class park and moving ahead as a city,” Murray said. Many citizens wanted something besides the deep tunnel — a preserved viaduct, a new one, more transit, or even a surface highway. “It’s all very bittersweet,” says Kate Martin, a former mayoral candidate who is skeptical people will pay tunnel tolls. She co-sponsored a losing campaign to replace the viaduct with an elevated park. “I’m kind of conservative on the fiscal side, so these debacles make me get all steamed up,” she said. Who pays what may take years to resolve. State Rep. Ed Orcutt, R-Kalama, last week filed a bill that would withhold state revenue sharing for transportation, liquor and marijuana taxes for health programs, and municipal courts unless Seattle pays any future cost overruns. The state’s 2009 legislation approving a tunnel said excess state costs would be borne by property owners who benefit, and “a promise is a promise,” Orcutt argues.